Check Boston’s outside temperature at 5 p.m. on Fridays and you’ll pay that amount for a night’s stay at The Colonnade Hotel, thanks to the hotel’s Frosty Fridays package. If the National Weather Service says it’s 9 degrees, for instance, you’ll pay $9 for your Friday stay, and then the usual $289 rate for Saturday night (two-night minimum stay). The deal, good through April 8, includes overnight accommodations for up to four people (ask for two queen beds), free overnight parking at the onsite garage, and either admission and ice skating rentals for four at Boston Common Frog Pond or tickets for the Old Town Trolley Tour. Bring the whole family and get a connecting room for the same deal. 617-424-7000, www.colonnadehotel.com. Twenty-two artists explore the theme of “paper” in a new exhibit at the Brattleboro Museum and Art Center in Vermont. “Open Call NXNE 2018: Works on Paper” features work from artists across New England and New York, whose pieces include drawings, prints, collages, watercolors, paper sculptures, and other creative forms. Sique Spence of New York’s Nancy Hofmann Gallery selected the artists out of more than 200 entrants. The exhibit runs through March 10. Three other exhibits remain on show, including “Touchstones, Totems, Talismans,” “Shimmering Mirage: Anila Quayyum Agha,” and “The Scarf: Joan O’Beine.” The museum is open every day except Tuesday, 11 a.m.-5 p.m. $8 adults, $6 seniors, $4 students, free for members and visitors ages 18 and under. 802-257-0124, www.brattleboromuseum.org. Celebrate the 300th anniversary of The Big Easy this year. The city hosts special celebrations, music events, fireworks shows, a visit by the Tall Ships, and more throughout the year (go to 2018nola.com). While there, stay at Ace Hotel New Orleans, located in the up-and-coming warehouse district in downtown New Orleans, and get up to 15 percent off room rates (mention “Tricentennial”). The 234-room hotel now offers special family-style dinners on Mondays at its onsite restaurant Josephine Estelle ($35 per person), and a prix fixe family-style meal on Tuesdays at its seafood and oyster bar Seaworthy ($29.90). Catch a Monday night movie beginning Feb. 5 at the hotel’s Three Keys theater as part of the Patois Film Fest, which presents films that touch on environmental or sociopolitical issues. 504-900-1180, www.acehotel.com/neworleans. Leave the snowy skies behind and head for Florida’s Kimpton Vero Beach Hotel and Spa, where an astronomer runs monthly stargazing events through March, enabling you to discover cosmic wonders and learn about the stars streaking across the night sky. The hotel hosts the free stargazing events for guests and members of the Vero Beach community on Jan. 25, Feb. 23, and March 23. An astronomer from the Treasure Coast Astronomical society will bring a telescope, present a talk, and answer questions from 6:30 to 8 p.m. Book your stay at least 10 days in advance and get up to 20 percent off your stay. Rates start at $340. 772-231-5666, www.verobeachhotelandspa.com. Throw a HEROCLIP in your suitcase, purse, backpack, or car and use it on all your adventures. This handy clip has a carabiner with an attached swivel and hook that morphs into different configurations, enabling you to hang or attach anything up to 50 pounds. Use it to tether suitcases together at the airport, keep your shoulder bag or jacket off the ground in a gritty public toilet, suspend your backpack in the wilderness to protect it from soggy ground or critters, or hold a dangling flashlight in place so you can change a flat tire. It also works well for hanging a bag on a stroller handle and attaching a booster seat to a carry-on bag. The clip measures 3 inches wide by 3.75 inches long when closed, and weighs just 2 ounces. It’s made of aircraft-grade aluminum, plastic, and steel. $19.95. www.myheroclip.com. Brace yourself against the cold with Stio’s new down-filled Shot 7 parka (for women) and jacket (for men and women), which offer stylish cuts and 800-fill down that keeps you toasty whether you’re walking to the train or scraping ice off your rental car. 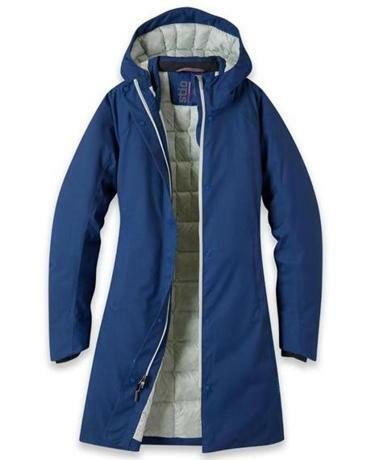 Both jackets, made by Jackson-based Stio, come with a Pertex waterproof yet breathable fabric that fends off snow and rain, and Allied Feather’s HyperDRY water-repellent down that resists moisture, dries faster when wet, and offers impressive loft. The women’s parka comes with an adjustable hood, an interior collar to block cold breezes, internal fleece cuffs with thumbholes, and an angled cut at the wrists that offers a hint of extra style and hand protection. The sportier men’s jacket can tackle the ski slopes — it has a helmet-friendly hood, removable powder skirt, pit zips, and a tucked-away RFID pocket — yet look smart enough for a dinner out or meeting. $599 women’s, $549 men’s. www.stio.com.